Steel-cased cartridges are an issue of hot debate – some even compare it to the 9mm versus .45 argument. While it's great and versatile ammo, steel casings do have a bad reputation among some sportsman. However, not many problems occur today with steel ammo (unless you’re pumping thousands of rounds each day or using cheap surplus military ammo from a foreign country). Steel casings have long been manufactured outside of the U.S., with Wolf and Bear being the biggest suppliers. The domestic production makes this ammunition a cost-effective option, and makes it popular among target shooters and sportsmen all over the world. Today, steel-cased bullets can be found in a variety of calibers. The most common are 7.62x39mm and steel-cased 9mm, but many other calibers are made with steel cases due to the cost effectiveness of steel vs. brass. Hornady is one of the most recent manufactures to introduce steel-cased ammo into their product line, which seems to be a success. Steel casings are one of the most misunderstood cartridge components out there. People say they rust, they jam, they corrode your firearms, they misfire – but these are not true at all. Today’s steel casings are coated with a polymer, making them very smooth as well as corrosion and rust resistant. You can still find older-style lacquered rounds that do have issues on occasion, but they are relatively hard to find. These sans-polymer rounds are still useable, but require good cleaning habits at the end of shooting sessions. Enthusiasts who like to experiment with different ammo for fun can still find plenty of lacquered types from companies like Brown Bear if they want to try them out or get them cheap. Overall, you will be hard-pressed to see a noticeable difference between steel-cased ammo and brass-cased. Compared to brass, you’ll pay less for steel case ammo almost every time. This can add up if you spend a lot of time on the range. Steel-cased cartridges can be coated in lacquer or polymer. These materials are very resistant to rust and offer more corrosion resistance than steel alone. Don’t like crawling around or stooping constantly to pick up your spent casings? A telescoping magnet or something equivalent will collect them quickly. And your back will thank you. 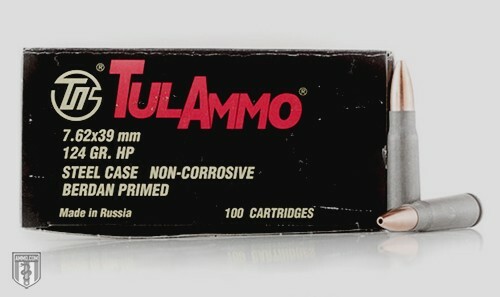 Due to different primers and the coating of the case, this type of ammo varies from one manufacturer to another. While this doesn't cause any issues, some studies have shown significant differences in the powder charge of the ammo from brand to brand. In some cases, one brand would cycle a semi-auto rifle, while a different one would not. Many ranges don’t allow steel-cased rounds. This isn’t a safety issue, but instead a cost issue. Ranges make money back by recycling brass rounds and/or reloading them to sell to customers. Steel-cased ammo isn’t worth as much as brass, and if Berdan-primed, typically won’t be reloaded. Steel rounds are perfectly fine to use on a regular basis, and can save you a great deal of money over the long term. And even though there are some people out there who feel strongly against this type of ammo, try it out for yourself before forming your own opinion.